Congrats to Evin Carter, Jessica Moore and Michael Van Nuland, who were recognized for Graduate Research, and Riley Bernard, Cassie Dresser and Marisol Sanchez-Garcia, who were recognized for Graduate Teaching, in the Inaugural Graduate Student Appreciation Week 2015. 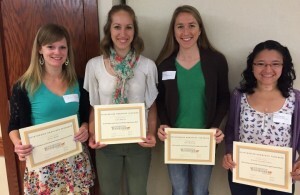 Below is a photo of four of the awardees, who attended an awards breakfast this week. Thanks to all of our graduate students who do outstanding work every day!